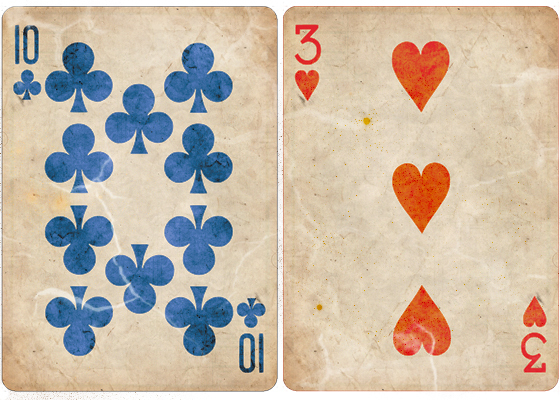 As a sucker for a good playing card deck (and wonderful graphic design), as well as someone who has been toying around with their own custom deck designs... this kind of blew me away. More about the project (including lots of images).. after the jump. 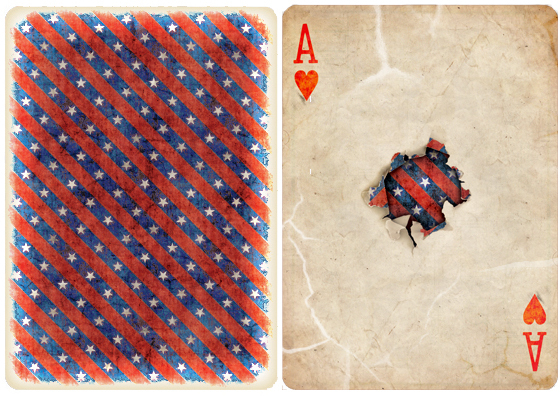 The Americana playing card deck is the second deck by Russell Kercheval, now of Circle City Cards. It's his second Kickstarter project (the last one was a hugely successful metallic gold card deck called Brimstone) and it's already well above it's funding goal. 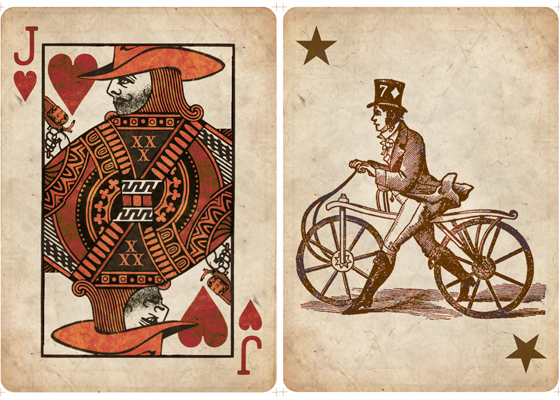 The Americana deck is a western themed deck that fits perfectly in the style and quality of other Bicycle brand decks. But what really shines is the wear and tear. 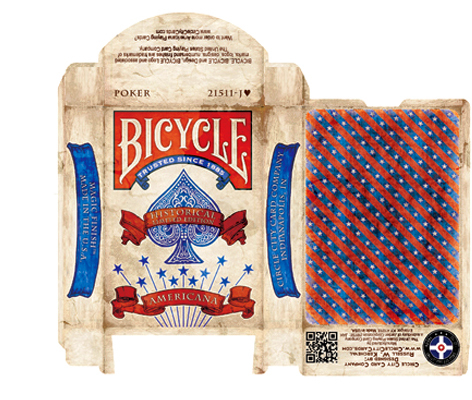 With the exception of the silly QR code on the bottom of the deck box, it looks like these have been around since the times of the Wild Wild West. Kickstarter-ers have been super creative with their pledges. We've seen projects that offered bonuses if the funding goal hit a certain amount over their initial goal. This project offers that as well as a buns if it receives 350 facebook likes (which it did). But the one that really stood out to me was the actual pledge amounts. First there was a limited pledge where 100 people could get as many decks as they wanted at $5 each. This was a discounted rate and sold out almost immediately. Then this went up $1 and again sold out. It finally went up one more dollar and settled at it's unlimited rate. They are still selling extremely well. The goal is $7,500. The project is currently at $24,899, but that doesn't mean you shouldn't support it! Hopefully Russell will keep making these custom decks, and by looking at the Circle City Cards site, it looks like there is another in the works. 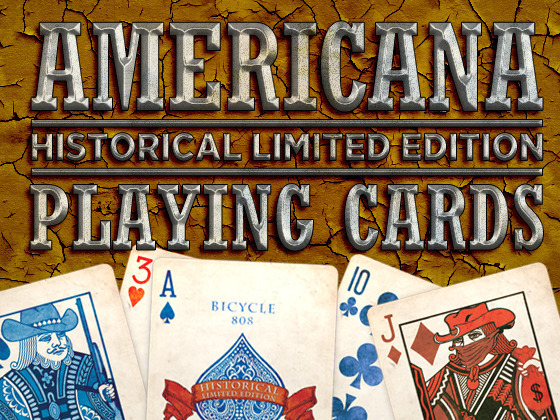 Check out the Americana deck on Kickstarter! The Zombie Card Game, If I'm Going Down is 130% funded with 4 days left. The Myachi Battle Paddle Project is 29% funded with 3 days to reach it's $2,500 goal.